While this quarter's earnings reports have crossed a substantially lowered profit bar, future expectations through the year indicate a recession could be on the way. That's an ominous recession sign for an economy that has barely managed to attain positive growth this year even with the strong level of earnings beats, according to an analysis by Nicholas Colas, chief market strategist at ConvergEx in New York. "Revenue estimates for the back half of 2012 have been slowly working their way lower this year," Colas said. "This trend, however, has accelerated to the downside over the past 30 days and we are fast approaching levels where these estimates are unambiguously pointing to the risk of a U.S./global recession later into 2012 and 2013." For the current quarter, about 69 percent of companies in the Standard & Poor's 500 [.SPX 1362.66 -13.85 (-1.01%) ] have beaten analyst profit estimates. Only 42 percent, though, have beaten on top-line revenue estimates, indicating that growth is weakening. That's evidenced by a rash of downward forward revisions from analysts. In Colas' analysis, though, he limited his look to the companies in the Dow Jones Industrial Average [.DJIA 12822.57 -120.79 (-0.93%) ]. Analysts now expect revenue to grow at just 1 percent to 1.5 percent pace in the third quarter. The forecast for the fourth quarter is 3.9 percent, though Colas says "I doubt any analyst could defend this point of view unless they expect a rapidly weakening dollar...or a truly epic round of liquidity-pumping operations from the world's central banks." Laksman Achuthan, at the Economic Cycle Research Institute, made headlines late last year when he said he expected recession to hit the U.S. in the first quarter, which, according to the most current data, didn't happen. "There have been a lot of economists and analysts who have had their blinders on for quite some time," said Brian LaRose, an analyst at United-ICAP in Jersey City, N.J. "We're not bullish on the recovery here in the U.S. We think that there are far greater problems ahead that have yet to be addressed." "When corporations feel the pinch from a slower economy, they lay off workers," Colas said. "When they law off workers the Fed executes on its dual mandate and increases liquidity. And when the Fed increases liquidity, stocks go up." LaRose, though, thinks investors "want a QE3 so badly, they refuse to accept the fact that there will be no QE3." "If the economy was plummeting into a recession then it would be obvious that monetary policy needed to be eased," said Paul Dales, chief U.S. economist at Capital Economics. "But, even allowing for the deterioration in the incoming data, the economy is still growing modestly, stock markets have not tanked and the euro-zone crisis is still rumbling along without ever really developing into a full-scale meltdown." Should the economic data continue to deteriorate and earnings through the rest of 2012 come in as low as Colas expects, the case will become clearer for a a recession and, perhaps, more Fed intervention. "The European crisis shows no sign of fading and, in the usual lagged fashion, should have increasing rather than decreasing collateral impacts on growth outside Europe," Ethan S. Harris, BofA's North American economist, said in a note. 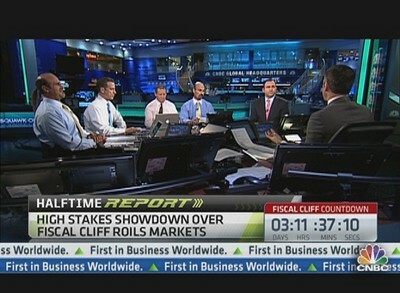 "Last but not least, the risks of the fiscal cliff have just started to work their way into corporate psychology," he added. "We are frankly a bit puzzled by the persistent optimism in consensus and official forecasts."